The City Council adopted Resolution #50-2018 calling an election for the submittal of the following question to the voters at the November 6, 2018 election. MEASURE S – TO PROVIDE FUNDING FOR INFRASTRUCTURE AND GENERAL CITY SERVICES INCLUDING, BUT NOT LIMITED TO, POLICE, FIRE, EMERGENCY PREPAREDNESS, STREETS, PARKS, OPEN SPACE, AND RECREATION, PLUS AFFORDABLE/WORKFORCE HOUSING SHALL CITY OF SONOMA INCREASE THE ONGOING TRANSIENT OCCUPANCY TAX (HOTEL TAX) RATE BY 2% ON JANUARY 1, 2019, AND AUTHORIZE AN ADDITIONAL 1% INCREASE BY JANUARY 1, 2024 (ESTIMATED $1,125,000 ANNUALLY ALL FUNDS USED LOCALLY), AND INCREASE THE CITY’S APPROPRIATIONS LIMIT FOR FISCAL YEARS 2018/19 – 2021-22 BY THE AMOUNT OF INCREASED TAX? The transient occupancy tax (or TOT), is also commonly known as a hotel tax. The tax is imposed on occupants of hotels, inns, and other short-term lodging facilities for stays of 30 days or less. The tax is applied to a customer’s lodging bill. Transient occupancy taxes are remitted for all approved lodging operators within the City of Sonoma, but a small number of hotels contain most of the rooms and generate the majority of the City’s TOT revenue. The TOT is a general tax which is deposited into the City’s General Fund. TOT currently represents more than one-fifth of the City’s General Fund revenue. The General Fund pays for essential City services that benefit both residents and visitors. These include police protection, fire and paramedic services, emergency preparedness, maintenance of streets and traffic operations, recreation services, maintenance of parks and open space, maintenance of City buildings and facilities, improvements and maintenance of overall City infrastructure and property, and general municipal services to the public. Learn more about the City’s finances in the overview section (Part I) of the City’s budget. Measure S would increase the TOT rate from the existing 10% to 12% effective January 1, 2019 and would authorize the City Council to further increase the rate to 13% within the next five years (by January 1, 2024). An increase from 10% to 13% would generate an estimated $1,125,000 in annual revenue for the City. Revenue generated by the TOT is expended at the discretion of the City Council, on any City programs or services. The ballot measure would also increase the City’s appropriations (spending) limit by the amount of the increased tax, in order to comply with State law (Gann Limit Article XIIIB of the California State Constitution, which was adopted by California voters in 1979 and placed limits on the amount of proceeds of taxes that State and local agencies can appropriate and spend each year). In early 2017, a group of local hotel owners (representing Sonoma Valley Inn, El Pueblo Inn, Inn at Sonoma, The Renaissance Lodge at Sonoma, MacArthur Place Hotel and Cottage Inn & Spa) approached the City Council to recommend an increase of the TOT rate from 10% to 12%. They stated that Sonoma was behind other communities in this tax collection opportunity, and that the additional tax revenue could be used to help the City with a variety of important “quality of life” investments. While there was interest from the City Council in pursuing this in 2017, State law mandates that local governments can only bring tax measures to the voters at a general municipal election when City Council Member elections are also on the ballot. Based on this, the City was unable to proceed until the November 2018 election. 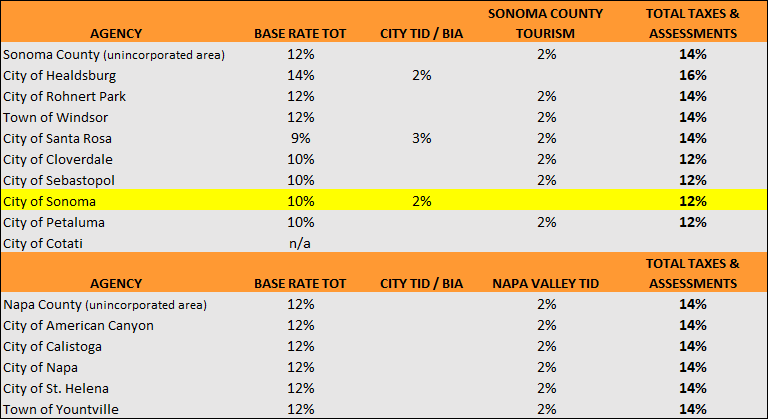 In the City of Sonoma, lodging operators collect both the 10% TOT and an additional 2% assessment that is remitted to the Sonoma Tourism Improvement District (STID) as a funding source for a sustained marketing program with the goal of increasing occupancy and room revenues in the City of Sonoma. The combined TOT and STID collection rate is therefore 12% currently. As in Sonoma, lodging operators in other communities in the area collect an assessment through a city or county tourism improvement district or similar mechanism. Both the TOT and any additional assessments are paid by the lodging customer, so while Sonoma’s base TOT is lower than most of these communities, it is also important to compare the combined total.